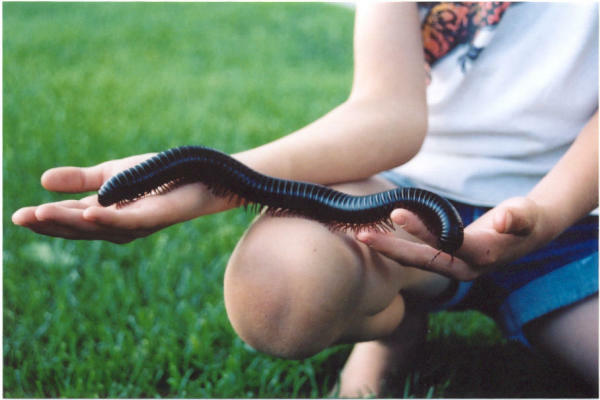 Description: Ruby is an African Black Giant Millipede, shes 12 inches long....give or take a segment. I like to fish and camp and fish and catch reptiles and fish. shes gunna have babies soon!! Jesus, I didnt know they got THAT big!!! Or is it on a very small child? Arrghh...!! It looks like its on steroids !! How many segments on that puppy ??? HOLY cow I have NO idea how many segments she has....count them and times it by 4 and youll get an approximate number of legs....Im not counting.!!! And Yes she crawls out of her cage every night and finds her way into our room and eats some brains lol!! She prefers apples...but brains will do. Like that other guy, I want one, as well, but I don't wanna pay $15 for one at SuperPetz when they don't even know what TYPE it is! But man, THAT THING'S HUGE!!!!!!!!! She was 15 bucks.... but I have a HUGE weakness for creepie things so I had to have her. She wore out my male and he ended up dieing....But still no babies. Gotta find me another male, my girls are lonely. way cool.........my two young millies, legs-a-lot and lots-a-legs are only six inches long........lot of catchin up to do. u must have some great tips on keepin millies??????? ?